While super moms from years gone by had the time for things like making their own Easter eggs and ironing, we modern folk often struggle to find time to cook dinner let alone to make our own Easter treats. But, what you probably do have time for is to spruce up a batch of shop-bought chocolate Easter eggs – because even Martha Stuart takes shortcuts sometimes! 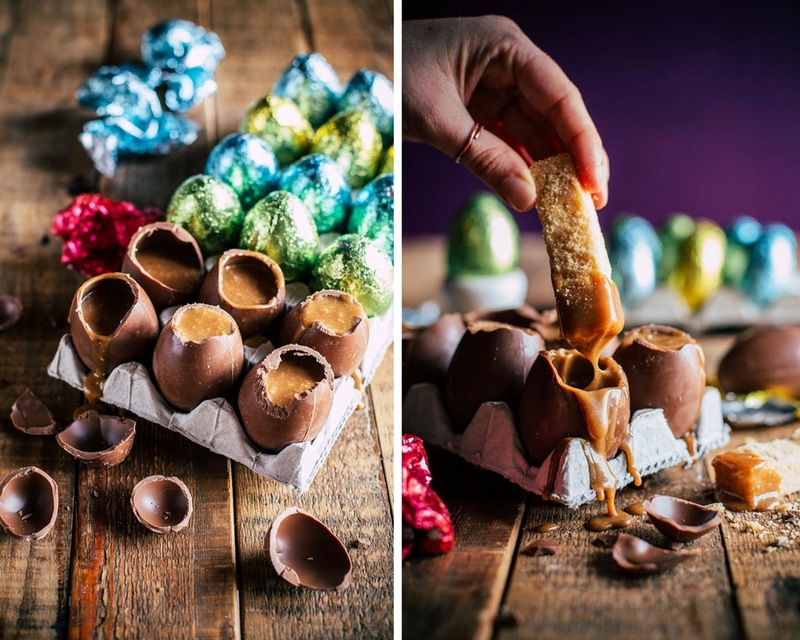 For this sweet take on the classic Eggs and Soldiers breakfast dish, Katelyn from The Kate Tin shows us how a quick and easy home-made caramel sauce and a batch of Shortbread biscuits can turn basic chocolate Easter eggs into pure deliciousness. Using a small sharp knife, cut the tops off the chocolate eggs (you can go ahead and eat the tops – we won’t be needing them). To make the salted caramel filling, place the butter and sugar in a saucepan and place over a low heat. Simmer for 8 minutes until the sugar caramelises and just starts smoking. Add the cream gradually while whisking. Stir in the milk chocolate and whisk until smooth. Allow to cool completely. To make the shortbread, cream the butter and icing sugar until light and fluffy. Add the flour and cornflour and mix to form a soft dough. Press the shortbread into a greased and lined square 20cm baking tin. Prick the base with a fork and bake at 180 degrees Celsius for 15-20 minutes or until just golden brown. Sprinkle the shortbread with caster sugar as soon as it comes out the oven. Cut into fingers while still hot. 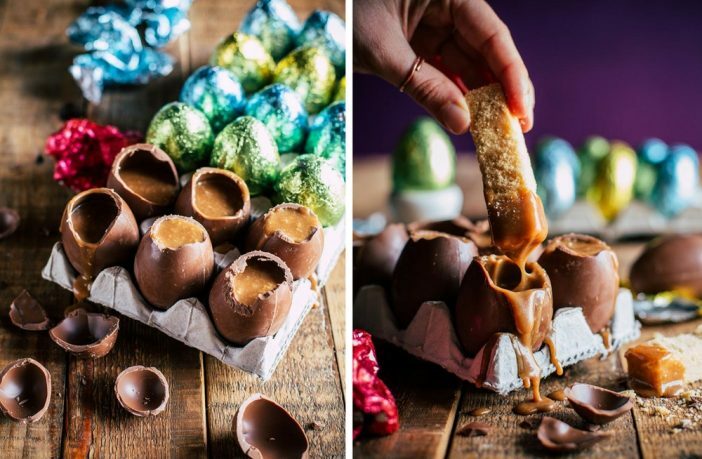 To assemble, fill the chocolate eggs with the caramel sauce. Serve the eggs with a sprinkling of sea salt and the shortbread fingers. Shop for Easter eggs and a wide range of baking and cooking goodies online here. Want more food news and recipes? Check out our Recipes & Cooking section for more delicious reads!